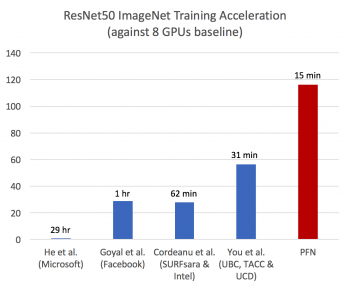 November 10, 2017, Tokyo – Preferred Networks, Inc. (PFN, Headquarters: Chiyoda-ku, Tokyo, President and CEO: Toru Nishikawa) has achieved the world’s fastest training time in deep learning by using its large-scale parallel computer MN-1 1. With the size of training data and the number of parameters expanding for the sake of better accuracy of deep learning models, computation time is also increasing. It is not unusual to take several weeks to train a model. Getting multiple GPUs to link with one another for faster training is very important to reduce the time spent on trial and error and verification of new ideas, and produce results quickly. On the other hand, it is generally known in parallel/distributed learning that the accuracy and learning rate of a model decrease gradually with increased GPUs, due to larger batch sizes and GPU communication overhead. This time, we have improved learning algorithms and parallel performance to address these issues, and used one of Japan’s most powerful parallel computers with 1,024 of NVIDIA(R)’s Tesla(R) multi-node P100 GPUs and leverages Chainer’s distributed learning package ChainerMN 2 for training. As a result, we completed training ResNet-50 3 for image classification on the ImageNet 4 dataset in 15 minutes, which is a significant improvement from the previously best known result 5. Based on this research result, PFN will further accelerate its research and development activities in the fields of transportation systems, manufacturing, and bio/healthcare, which require large-scale deep learning. Chainer is a Python-based deep learning framework being developed mainly by PFN, which has unique features and powerful performance that allow for designing complex neural networks easily and intuitively, thanks to its “Define-by-Run” approach. Since it was open-sourced in June 2015, as one of the most popular frameworks, Chainer has attracted not only the academic community but also many industrial users who need a flexible framework to harness the power of deep learning in their research and real-world applications. ■ About Preferred Networks, Inc.
＊Chainer（R） is the trademark or the registered trademark of Preferred Networks, Inc. in Japan and other countries.